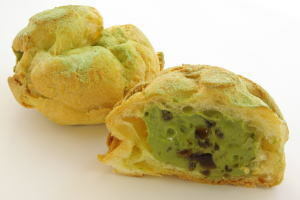 Matcha Shukurimu ('抹茶シュークリーム', is classified into sweets), is known as Green Tea Cream Puff in English, and 抹茶泡芙 (Mǒchá pào fú) in Chinese. It is the Japanese style sweets. Egg, Wheat Flour, Granulated Sugar, Sugar, Whipping Cream, Butter, Milk, Vanilla, Green Tea Powder.